I was at work yesterday just cleaning up around closing time, and one of the regular Yankees/card guys decided to stop by. He came up to me and handed me a card, and said he had to run but he'd wanted to give me the card he was promising me he had since we met a couple of months ago. 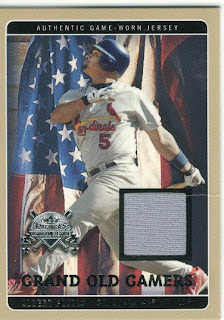 Len handed me a 2005 Fleer National Pastime Game Used Jersey card. Sweet!!! I don't have it either, which makes me happy. I offered him cards for a trade later, and he said not to worry about it. One day I'm sure I will come across something that he might want to send his way. I like nice people, and I love Albert Pujols. I'll be back later with a birthday present post. It is a sweet one, too.